As you approach Norwich station, a large 19th century building in the midst of 21st development can be seen. Being a mainline terminus it still gives off that Victorian grandeur, even though there are only six platforms now, but trains still go on five different routes from here. It is interesting to see that Norwich's biggest employer, Norwich Union now sponsor's the station with its logo on all the station signs. We depart on time and a large siding in front of Norwich City football club can be seen on the right. We pass under our first bridge and Norwich Thorpe Junction appears with the main London line branching off to the south. We pass various sidings and sheds for the rolling stock and the electric gantries continue for some time before they stop altogether. We soon see the river Yare and various broads on our right, whilst the built up area of Norwich continues on the left. At Whitlingham Junction the Cromer and Sherringham branch veers off to the north. Then we go under the A47 flyover and we are finally free of Norwich and out into the beautiful Norfolk countryside. The train picks up speed and reaches something like 60mph, before we slow down for our first station, Brundell Gardens. Our train isn't stopping here, but we pass more large pools of water and see Brundell Marina on our right, which is just before our first stop, Brundell. The old station building is still standing and there is a level crossing house to the eastern side of the station, plus a big old signal box, still manned, as this is where the Great Yarmouth direct branch leaves the Lowestoft branch. We continue on double track, whilst the Yarmouth line becomes single track. The scenery becomes more wooded now with reed beds on either side of the line. The driver blows his horn as we pass yet another level crossing, one of over twenty on this line alone. We shoot past Buckenham station and then the trees clear to see flat broad land all around us. We can see boat sails gliding along the river in the distance. Nearby are several herds of cattle grazing on the green meadows, with the occasional swan sitting there. We stop at Cantley, which has plenty of greenery in the form of small tress and bushes. There's a small bus stop shelter but there's no graffiti here and it's a pleasant enough station. There's a signal box and crossing box at the end of the platform. To the south of the station is a large sugar-beet factory and the smell permeates the train. Again the land becomes flat with sheep taking over from cattle as the main animals. We stop at Reedham, which has its original station building, but many of the windows are bricked up and painted black. It does have a quaint footbridge painted green and cream. We see Reedham Junction signal box and the remains of sidings that are long overgrown. Then the line for Lowestoft continues to the south whilst we pull away on the branch for Yarmouth on the original Yarmouth line, which is now single track all the way to Yarmouth. The land is once again very flat with more marshland than fields and the odd windmill can be seen, with less and less housing. In fact all roads disappear and we are in a very bleak landscape. The train speeds up as it crosses Halvergate Marshes, but then slows down to stop at Berney Arms station. This is perhaps one of the most remote railway stations in the UK, with just a small platform only long enough for the first carriage to stop on. It has a small shelter and station sign and that is all. We stop because there are a couple of walkers waiting to get on the train. I hop off quickly and take a couple of photos. There's no road here or station buildings. These were demolished several years ago. We pull away and in the distance you can see the skyline of Great Yarmouth on the horizon, around five miles away. We see plenty of walkers on the sea wall, which protects the marsh from the estuary of the River Yare. Eventually we see cars again on the A47 and meet up with the direct line from Norwich. We stay on the up track and run parallel to the down track. There are several overgrown carriage sidings, still here, presumably only used for the rare summer specials that come here from the Midlands in the summer. We also see a holiday camp, which bears the legend, "Vauxhall Holiday Park Welcomes you to Great Yarmouth". We then pass Yarmouth Vauxhall signal box on the left and arrive at Great Yarmouth station about two minutes early. The station is a modern building which seems to be on the edge of the town and nowhere near the town centre or seafront. There doesn't seem to be any signs of the original building and there are only two platforms so it would seem that summer specials can only fit in when there is gap between the local trains. The return journey to Norwich is late leaving and the guard comes along the carriage and asks where everyone is going. 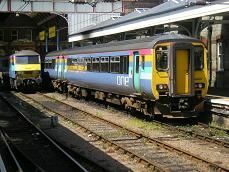 Most people seem to be going to Norwich and some are concerned that they will miss their connection for London at Norwich. Then he announces the reason for the delay. The reason is that the signal is down due to the swing bridge at Reedham being stuck, delaying the trains from Lowestoft and thus our train. Ten minutes later than advertised the signal rises to let us out of the station and we set off. We are scheduled to return the same route but at Breydon Junction we continue straight on, running alongside the A47. Now I know why he asked everyone where they were going. If some one had wanted to go to Berney Arms that would have delayed the train even more. I don't know if anyone was waiting at Berney Arms expecting a train to arrive, but if they were it would have been a long wait as this was the last stopping train of the day! The driver is obviously wishing to catch up on lost time and so we must be doing around 80 mph as we overtake the cars on the road to our right. We slow down for Ackle station but don't actually stop. It has two platforms, as this is a crossover station. It's a pity we don't stop as the original station building is covered in old signs like Lyons Cakes, etc and looks to be very well kept. Soon after we come into the only cutting on the whole journey as the land rises all around us. There are ploughed fields in the gently sloping land. We accelerate again and flash past Lingwood station. From what I can see it is the original station house and looks to be in good order. We make it back to Lowestoft line at Brundell where we arrive only two minutes behind schedule. We then press on for Norwich and would you believe it, we arrive bang on time with five minutes to spare for those trying to make the London train, so all is not lost. Plus I've had a round trip from Norwich to Great Yarmouth all on the same train!